The Federal Government yesterday ordered foreign miners in Zamfara State to leave within 48 hours. It also announced the suspension of mining activities in the state to curb the activities of armed bandits. The move followed an attack that killed about 50 persons in the state at the weekend. Briefing State House correspondents at the Presidential Villa in Abuja, Acting Inspector General of Police Mohammed Adamu warned that foreign miners who violate the order would have their licences withdrawn. He said investigations had established a link between the activities of the bandits and illicit miners and that security forces would be dispatched to the state. It reads: "As part of sustained efforts to flush out, and permanently put an end to armed banditry and criminality in Zamfara State, in particular, and the northwest in general, the Nigeria Police Force in collaboration with the Nigerian Military and other security services has commenced 'Operation Puff-Adder', which is a full-scale security offensive against the bandits. "The operation is aimed at reclaiming every public space under the control of the bandits, arrest and bring to book all perpetrators of violence in the area and their collaborators, achieve a total destruction of all criminal camps and hideouts, mop up all illicit weapons fueling the violence, and attain a full restoration of law and order in the affected communities. "Our commitment to protecting the sanctity of life and property is irrevocable and we will not scale down the pressure on the armed bandits until they are totally flushed-out." The IGP also warned against "the use of social media to spread fake news, falsehood and deliberate misinformation." He urged citizens to "exercise restraint in circulating unconfirmed information capable of doing more damage to us all." The press briefing was attended by Chief of Staff to the President Abba Kyari; Director General, Department of State Services (DSS) Yusuf Bichi; and Director General National Intelligence Agency (NIA) Ahmed Abubakar. 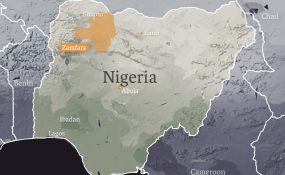 But while the Federal Government tried to rein in bandits in Zamfara, unknown gunmen invaded Birnin Gwari, a suburb of Kaduna State, Saturday evening. For several hours, the attackers were said to have held Kakangi Village hostage, shooting indiscriminately and setting houses on fire. "We were sitting in front of the police station. Suddenly heavily armed bandits started shooting. I jumped over the fence and escaped. As I fled, I saw thick smoke from different locations rising into the sky," said a resident who sought refuge at Gagumi Village, about 20 kilometres from Kakangi. Unconfirmed reports claimed many people were killed. The police however put the figure at five. Three attackers and two officers lost their lives, while seven civilians sustained injuries, said spokesman, Yakubu Sabo. He said: "We received a distress call through DPO Randagi on 6/4/19 at about 1900hrs that armed men in large numbers entered Kakangi Village of Birnin Gwari LGA, a neighbouring community to Niger State, shooting sporadically, attacking the villagers. "Combined teams of PMF personnel, conventional police and vigilantes were quickly mobilised to the village. They engaged the bandits in a fierce gun duel and successfully repelled the attack. "Our gallant men gunned down three of the bandits and several others escaped into the bush with bullet wounds. However, two of our men paid the supreme sacrifice during the intense gun duel." Criticising the Federal Government's handling of security, Mr. Yinka Odumakin, National Publicity Secretary of Yoruba socio-political organisation, Afenifere, warned: "Nigeria may soon be in serious trouble," unless the current administration stopped its alleged mis-governance. The National Chairman of African Democratic Congress (ADC) Chief Ralph Nwosu, on his part, blamed the alleged failure of the current government to explain to Nigerians what it has done with the defence budget. But speaking during the launch of Operation Puff-Adder at the weekend, Adamu stressed that victory over bandits and other criminal elements could remain a mirage, despite the deployment of various police units. "While we, as security agents, will provide the lead in the prevention and detection of crimes, the public should provide us with credible information. The farthest we can go in this task is to be dependent on the commitment of citizens across all communities to volunteer quality information to law enforcement agents," he said. According to the police boss, "we should appreciate that hoarding information on criminals, providing safe haven for criminals, or acting as accomplices in any form is tantamount to riding on the back of a hungry tiger and endangering not just oneself, as an individual but also the entire community."